Response Nasi Goreng with Hot Dogs - thirstDays No. 11 Eat Rice Yet? When I was a kid I was allergic to wheat and dairy. In those days, words like “gluten free” were definitely not found on all manner of food packaging or in a dedicated section of the grocery store like they are now. Being a kid, my fondness of vegetables was also limited. So I ate a lot of meat and I happened to absolutely love it. Every Halloween my Opa would give me a dried sausage that I would savour for weeks, taking it out of the fridge every day and delicately nibbling away at it. In any case, my mother had her work cut out for her when it came to getting vegetables in my mouth — even more so because dinner time was my bad temper’s golden hour. One solution whose flavour has stuck on my tongue was nasi goreng, or “fried rice.” Being from a Dutch family on my mother’s side, Indonesian food was common, a lasting connection to the Netherland’s colonial ties with that country. An amalgam of leftovers with fried rice wrapped in a warm smoky flavour, the nasi goreng of my childhood involved cut pieces of hot dog and frozen peas. I would help my mother or watch as she moved the rice around our heavy yellow wok. Red flecks of chilli. Bright and happy green peas. A bubbling pot of wieners. My mother humming, singing and whistling as she moves about the house, opening the windows to air the smell from the kitchen. As an adult I introduced nasi goreng to the man who is now my husband, though without the hot dogs and with a great deal more sambal, a chilli sauce that I always have on hand in our house. Eat Rice Yet? curated by Henry Tsang and Diyan Achjadi, was tightly organized around the smells, tastes, sights and memories of food and drink. The experience of food, of sharing a meal, which has been present to varying degrees in all of the thirstDays events, was here given its full due, allowing the cross-cultural, familial, political, and spiritual nature of food to come to fruition—a rich and complex broth simmering under attentive eyes. I kept thinking about the entirety of the event as a recipe in itself, with all the flavours of sake, horchata and kimbap enriched and accented by the presentation of video, story and song. The star, of course, was rice, taking centre stage with humble grace and gravity as a meal in itself, a side dish, a carrier of delicious sauces, a container for fish and vegetables, full of potential. Each presentation of the evening enriched the appreciation of rice in itself and illuminated profound connections and separations between us. Rice was an active agent within this, a proposition for new understandings. Michael Rakowitz’s Dar Al Sulh (Domain of Conciliation) (2013) began the evening with the words, “You know it really is a pity how we treat each other now. I know you can’t forgive me but forgive me anyhow?” (1) A video document of the restaurant project that operated in Dubai for one week and served Iraqi-Jewish cuisine, Dar Al Sulh refers to a legal territory or domain in which an agreement between Muslims and non-Muslims ensures the freedom of religion, autonomy and protection for all. The project stems from Rakowitz’s ongoing Enemy Kitchen (2003-) where he teaches participants to cook recipes compiled with his Iraqi-Jewish mother, creating the conditions for a discussion of Iraqi culture in America that moves beyond media portrayals. Similarly, Dar Al Sulh presents possibilities for the representation and interaction of Iraqi and Jewish culture in the wake of Jewish exodus from Arab lands in the 1940s. Serving platters sourced from antiques dealers in Israel that survived the journey of the Iraqi Jews out of Iraq, parallel the preciousness of the cuisine served as both the recipes themselves and the Iraqi Jewish Arabic language are under threat of being lost. “You are eating a dying language from the plate of a ghost,” words adorning the window of the restaurant, remind visitors of the implications of the experience they are having despite the conviviality of it all. Following the screening, Meeru Dhalwala, co-owner of Vij’s and Rangoli in Vancouver, gave a talk—”A Grain of Rice, a Pot of Rice”—about opening a restaurant in Seattle: Shanik. She attracted female staff who were immigrants and refugees from India, Ethiopia and Eritrea by visiting convenience stores and Walmarts and “greeting people who looked Indian,” advertising a safe place for women to work. What was immediately evident in Dhalwala’s talk was a sense of humour and honesty that comes from the practical realities of running a kitchen. She described the restaurant as a “cultural mess,” divided along ethnic lines with caucasian front-of-house staff, Indian cook staff, and Ethiopian and Eritrean cleaning staff. In rapid fire she discussed the many differences that kept these women separated: not speaking the same language, differences in religious beliefs, and dietary practices. It was a slow and difficult process to bringthese women together. The cuisines of their home countries share some common spices, so they learned the names of these in each other’s languages to break down barriers in communication. It wasn’t enough. One day, however, Dhalwala was cooking a simple rice pilaf with basmati, red bell peppers, yellow bell peppers, turmeric, cilantro, jalapeño, and toasted cumin. It was a meal that everyone in the kitchen could eat, and they enjoyed it so much that they began to sharing it around the same table, even enticing the front of house staff to join in. The conditions for conversation were set and the kitchen staff had an unexpected (at least for the audience, perhaps) moment of bonding when Dhalwala casually asked one of the staff, who was Eritrean, if she would be interested in Oguz Istif, Dhalwala’s partner in the restaurant. This sent the entire kitchen staff into a disapproving frenzy because of Istif’s Muslim heritage. Dhalwala’s frankness about this experience of bonding over a shared discrimination against another had the audience laughing together. It was totally unidealized, stemming from long seated prejudices as well as the continued conditions of separation experienced by many immigrants and refugees in the United States as well as Canada. Despite this, their distance was lessened in the simple act of sharing rice. As she spoke, we were fed small cups of rice from Vij’s and shared in the retelling of this story. First Intermission: I drink a cup of sake and eat kimbap, a Korean seaweed rice roll (or three). 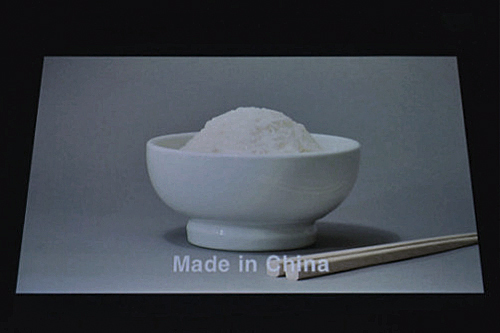 The second act began with a meditative video work by Chee Wang Ng, 108 Global Rice Bowl (2008). The object of meditation is a rotation of white rice in white bowls, varied in shape and size, and shot against a cool grey background. A pair of pine-coloured chopsticks are laid in front, creating a diagonal line that moves off to the right of the screen. The composition is carefully considered. Each well rounded mound of rice is proportionate to its vessel. With each new bowl of rice, a chime sounds—similarly varied in its tone and pitch—and a different country is inserted into the phrase “Made in _____.” China and Japan make multiple appearances along with Canada, Thailand, Vietnam, France and many others. The 108 tones correspond to the number of beads in a Buddhist rosary, aligning the path to enlightenment, or the repetition of a powerful mantra, with the simple grace of rice. The connectivity between places of vast geographical distance is also brought to bare in the repetition of this similar image and object of contemplation, speaking to the movement of bodies and goods that transcend borders. I sat that with over the second intermission where I tried a different kind of sake and shared a cigarette in the cold December night. Following this enrapturing performance, Hank Williams’ “Jambalaya (On the Bayou)” came on—which is my favourite Williams’ tune—and we all gathered around a table of rice dishes: Nasi Uduk with sweet coconut, Nasi Kuning with savoury turmeric. I drank a final cup of sake, this time from the Fraser Valley where the fertile soil supports rice agriculture, and talked with Henry about my memories of eating Nasi Goreng. I left buzzing on sake and the deep warmth that the sharing of food threads throughout all of history. 1. Leonard Cohen, “Anyhow,” Old Ideas, 2012. 3. “Heartbeat, it’s a Lovebeat,” The DeFranco Family, 1973. Tarah Hogue is a curator and writer of Dutch, French and Métis ancestry originally from the Prairies. She is Curator with grunt gallery since 2014 and is the 2016 Audain Aboriginal Curatorial Fellow with the Art Gallery of Greater Victoria. She is currently working on #callresponse with Maria Hupfield and Tania Willard along with invited artists Christi Belcourt, Ursula Johnson, and Laakkuluk Williamson-Bathory. She recently curated Unsettled Sites, a group exhibition with Marian Penner Bancroft, Wanda Nanibush and Tania Willard at SFU Gallery. In 2009 she co-founded the Gam Gallery. She has written texts for Canadian Art, Decoy Magazine, Inuit Art Quarterly, MICE Magazine, and others.